[dropcap size=big]T[/dropcap]win stick shooters rule. Some people think they’re remnants of the past but I believe such an awesome form of arcade-style play deserves continued attention. Back in 2012 a project called Monsters! (exclamation point required!) launched on Kickstarter with a goal of $4,000. In the end it reached that goal and even made a bit extra. Pitching itself as a “2D shooter with a twist” the game found an audience via crowdfunding before finally launching in 2013. Unfortunately, I missed out on the whole thing until 2015. This is a shame as more people definitely need to hear about this strangely addicting shooter. Monsters! was inspired by Robotron 2084, which is no doubt one of the greatest arcade shooters out there. You can definitely feel that inspiration once being plopped into the first level. 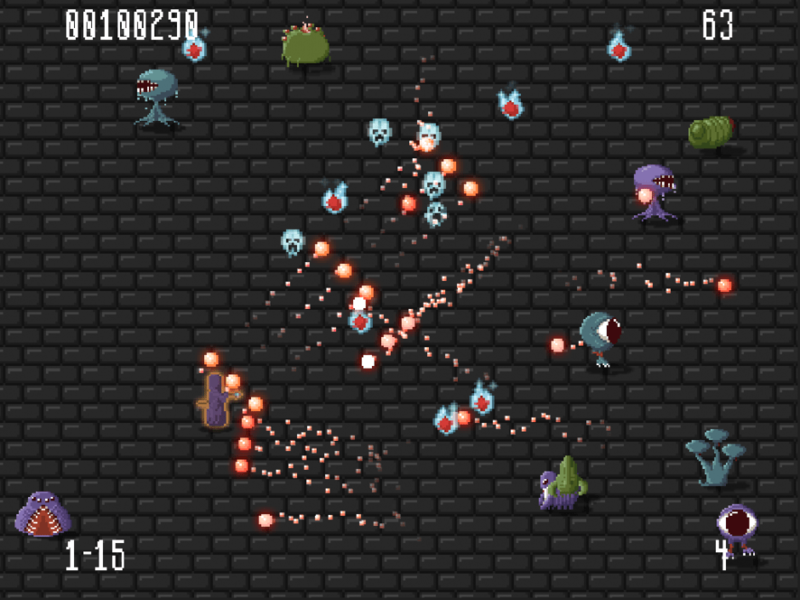 You, as a small pixelated wizard, stand in a room which is immediately filled with monsters. 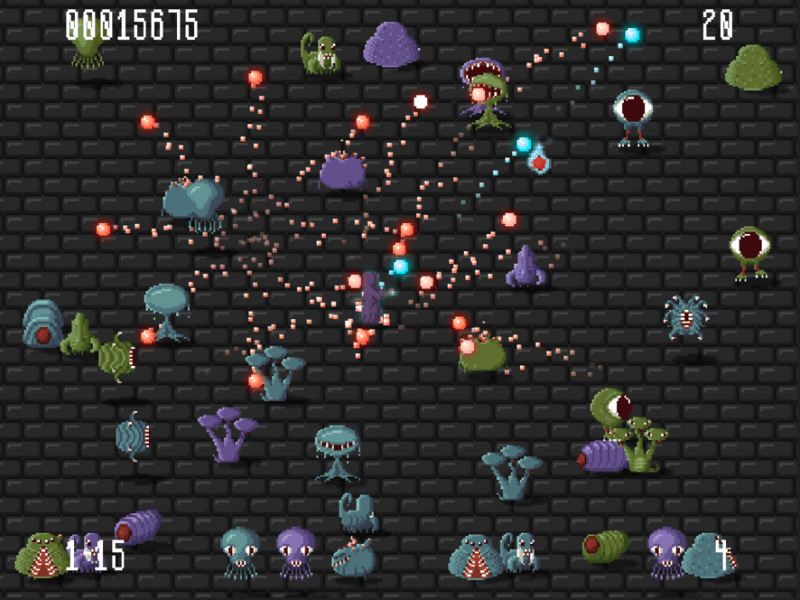 At first, the creatures are primarily big blobs but as you proceed to later stages more types are added. If you weren’t frightened by jelly monsters you’ll definitely take issue at ones which fire back, or larger beings with painfully sharp teeth. There’s only one “room” the size of the game window and after clearing each monster from one stage you go onto the next. So what the heck makes this different from any other samey twin stick shooter? The mechanic of shooting is tweaked so that each shot lowers the wizard’s health. No longer can you simply fire continuously to make paths through quivering monsters. Now you have to be considerate of health and when to shoot. Thankfully, you can regain health simply by picking up the spirits left over from dead monsters. If you take too long they’re simply evaporate into nothingness, so be quick! Some spirits have different coloration and when picked up they confer a temporary shot upgrade. As someone who definitely lives by the creed of “spray and pray” in shooters Monsters! completely took me by surprise. I had to suddenly start thinking about where my shots would go and carefully time and position them for successful hits. This is totally antithetical to most twin stick shooter design – and smart. Although it looks so similar to many other titles this one change creates a completely different atmosphere. Now the experience is tense and slower. It’s also much harder. These are all good things as long as you can handle it. Monsters! allows for both keyboard/mouse play and Xbox 360 gamepad support. Because of my own history playing twin stick shooters with joysticks and controls, the gamepad was definitely my go-to device. With that said, the keyboard controls certainly function too, and you can always rebind the keys if WASD and arrow key control is a problem. Oddly, upon first startup my 360 controller would not register side to side movement in game and only vertical. Whether this is a little bug of the game or my setup is unknown, but the issue was quickly resolved regardless. If you’re looking for a less mindless twin stick shooter then Monsters! should be calling your name. The game runs on Windows, Mac, and Linux and is super cheap at $2.99. Honestly, the concept is so neat it’s surprising more people haven’t attempted to iterate it further.